According to report published by Grand View Research,The global medical pendant market size is anticipated to reach USD 159.01 million by 2025. Availability of technologically advanced devices and favorable government initiatives are some of the key trends contributing to market growth. 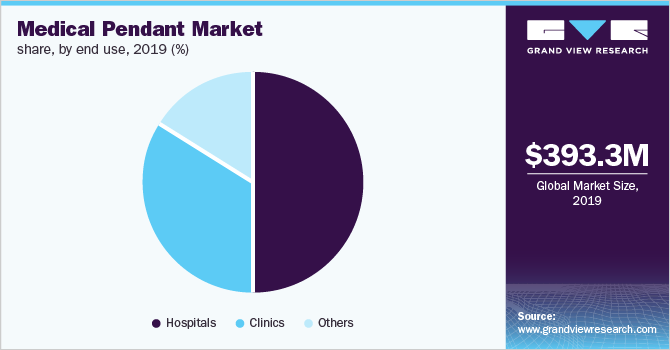 The global medical pendant market size is anticipated to reach USD 159.01 million by 2025, according to a new report by Grand View Research, Inc., expanding at a CAGR of 6.9% during the forecast period. Availability of technologically advanced devices and favorable government initiatives are some of the key trends contributing to market growth. Medical pendants are used by healthcare professionals for positioning various medical devices and other necessary objects while performing procedures or surgeries. Globally, healthcare professionals are acknowledging their benefits and increasing adopting them in surgery, endoscopy, anesthesia, ICU procedures, and other healthcare specialties such as obstetrics and gynecology. Technological developments, such as button-press enabled medical pendants, facilitate system’s arm movement as required. Devices with various ultraflexible configurations & multifaceted designs are commercially available and focused on fulfilling requirements of healthcare specialties. They are gaining traction worldwide. This is estimated to propel the market. Presence of favorable government initiatives, such as the initiative by the Indian government pertaining to indigenous manufacture of medical equipment, is anticipated to provide an upthrust to the market. The government of Jordan expanded its e-health initiative system to public hospitals and beyond. This, coupled with rising medical tourism, is likely to boost the demand for these devices in the country during the forecast period. The International Trade Administration stated that medical tourism generates more than USD 1.2 billion revenue annually in Jordan. In 2014, around 250,000 patients traveled to Jordan for treatment and this number is expected to reach 300,000 by 2018. Some of the major players are Elektra Hellas S.A., Starkstrom, Brandon Medical Co. Ltd., Skytron LLC, Ondal Medical Systems GmbH, Surgiris, BeaconMedæs, MEDIMAXKOREA, Tedisel Medical, and Megasan Medikal.